I grew up loving Edgar Allan Poe’s writing, and he became one of my first literary heroes. I knew he had lived in New York City, and a long time ago a friend I was visiting in the Bronx pointed out his cottage. But it was closed that day, and the closest I’d ever come to seeing it since was through the window of a passing car. 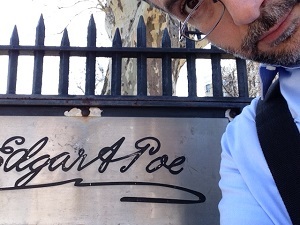 So, I was very happy to when Charlie “Chevere” Vazquez, of the Bronx Writers Center, invited me to teach a series of crime writing workshops in Poe Park, the home of Poe’s cottage. This weekend, I got to the park an hour before the workshop began and waited impatiently for the cottage area to open its gates. The cottage stands anachronistic against the enclosing brownstones. Stepping inside is, as expected, a kind of time travel. The tour guide on duty, P. Neil Ralley, gave me a brief tour of the kitchen, the living room (what a fireplace! ), and the melancholy bedroom in which Poe’s wife died. But I lost track of time and had to run to the workshop. I went back after the workshop (which went fanastically, by the way, and you should totally come up to the Bronx, enjoy the weather, the wide space of sky above the park, the writing exercises, and then the menagerie of food on Grand Concourse), and Mr. Ralley was kind enough to allow me to return for a full tour. I went upstairs (narrow, small rooms, low ceilings — but I would rent it in a tell-tale heartbeat should it ever become available). Go the the museum’s for more information on the cottage where Poe spent his last years. The workshop, by the way, is part of the newly formed Bronx Crime and Noir Writers Society and will be held monthly, with Charlie and I alternating as presenters. I’ll be back there in June. A real, live bird. 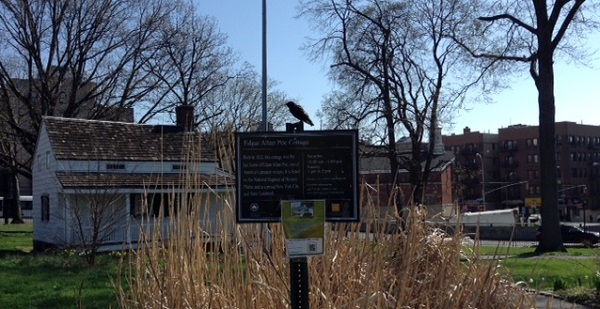 No, it’s not a raven.